The Kansas City Royals and the Chicago White Sox are former MLB World Series champions that have struggled a little as of late. The Royals clinched the biggest title in the sport in 2015 but have failed to make it to the playoffs since. On the other hand, the White Sox won the World Series in 2005 but have not made a trip to the postseason since 2008. Now these two sides will square off in a series of games and their fans will get the chance to see who is in better form right now. Book your Kansas City Royals Vs Chicago White Sox tickets and watch as the action unfolds live. Fireworks are expected when the Kansas City Royals and the Chicago White Sox collide this season. Both sides will be looking to get back to winning ways and will give it their all when they face off next. The fans know what is in store and that is why Kansas City Royals Vs Chicago White Sox tickets are in demand. The Kansas City Royals were incepted in the year 1969 but the wheels for that were set in motion two years earlier. In 1967, the city's baseball team the Kansas City Athletics decided to move and relocate to Oakland. That was a big blow to Kansas as it left the city without a baseball franchise for the first time since 1883. Stuart Symington, a senator was having none of that and threatened the MLB that he will bring in legislations that will take away the sport's antitrust exemption. In 1967, MLB held a meeting to discuss expansion teams and as a result of that Kansas City was awarded a franchise. The new side was to start playing in 1971. Symington intervened once again and convinced the MLB to let the new sides (three other cities got expansion teams too) start playing in the year 1969. The Kansas City Royals made it to the postseason for the first time in 1976 and then repeated the trick for the next two seasons. In all three of those campaigns, they would lose to the Yankees in the ALCS. In 1980, that changed. The Royals beat the Yankees in the ALCS and went all the way to the World Series where they would come up short against the Phillies. Five years later, Royals found themselves in the World Series once again. They were not to be denied on that occasion and beat the Cardinals to win their first ever World Series title. That victory however did not bring their way too much success afterwards as the Royals won no title for the next few years. Their fortunes began to change in the 2010s. They won a pennant in 2014, their first since 1985 and third overall. The Royals lost the World Series that year against the Giants but won it the next year by defeating the Mets 4-1. The Chicago White Sox were formed way back in the year 1888 and that makes them one of the oldest baseball teams in the country. The White Sox also have the distinction of being among American League's chartered franchises. While they were formed in 1888, they began to play as a professional baseball side in 1901. The White Sox began to play as a minor league team and were named the Sioux City Cornhuskers. They used to be members of the Western League back then. In 1893, the Western League reorganized and the next year was bought by Charles Comiskey. He re-located the franchise to Saint Paul. The WL then changed its name to the American League in 1900 but it was still operating as a minor league. Comiskey's team moved to Near South Side and won the pennant in the league's last campaign as a minor league franchise. The AL became a major league from the 1901 onwards. The Chicago White Sox clinched the World Series Championship by beating their rivals, the Cubs in 1906. They had already won their first pennant in 1901. That 1906 triumph was followed by a barren run of around a decade that was ended in 1917 when the White Sox won both the AL Pennant and the World Series for the second time in their history. They won another pennant two years later. The White Sox returned to form in the 2000s. They won the division title in 2000, their third overall. In 2005, they returned to the summit once again by winning their first World Series since 1917. They also got their hands on a pennant and a division championship that season. The stage is now set for these two historically successful sides to collide on the field once again. It should make for some exciting games between these two sides this season. 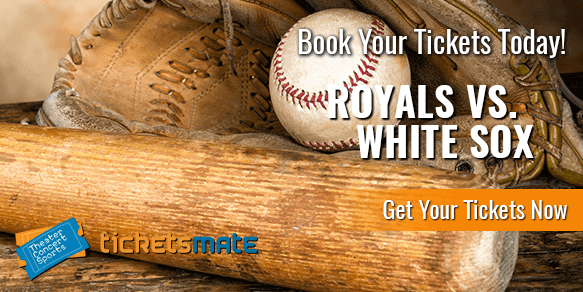 Book your Kansas City Royals Vs Chicago White Sox tickets and watch every second of the action live at the ballpark. Baseball season is here and is packed with epic matchups. You can catch all the action live as it happens. Next event featuring Kansas City Royals Vs Chicago White Sox will be Chicago White Sox vs. Kansas City Royals, held at the Guaranteed Rate Field in Chicago. As of now, the last event, Chicago White Sox vs. Kansas City Royals is scheduled for 12-Sep-19 at the Guaranteed Rate Field in Chicago. For complete itinerary of events, please visit our website. The average price for Kansas City Royals Vs Chicago White Sox Tickets start from $67. The minimum get in price is $5 for Kansas City Royals Vs Chicago White Sox Tickets at the Guaranteed Rate Field, Chicago. For a detailed look at ticket prices and amazing discounts, visit our website. Use Event18 as the discount code and get up to 70% discount on Kansas City Royals Vs Chicago White Sox tickets. This is a last minute opportunity to get the discounted tickets for Kansas City Royals Vs Chicago White Sox. Q:How much will I be charged for Royals vs Sox tickets? A:For pricing details please visit the Kansas City Royals Vs Chicago White Sox Tickets page on our website. There, you will find the prices of complete ticket listings along with other details like, day, time and venue of the game. Both, Kansas City Royals and Chicago White Sox are former World Series champions so, watching them go head to head would be a real humdinger.